« SISTAH VEGAN ON ‘BLACK WOMEN’S LIVES MATTER’ : FREE MARISSA ALEXANDER NOW! As I’ve been a Boulderite for nearly two years now, it’s about time I put together a roundup of my favorite vegan eats in this town by the Rocky Mountain Front Range. Boulder is renowned for being a foodie (and beer-centric) city, but to be frank, that reputation skews heavily towards omnivorous fare. Still, there’s plenty of gems for us herbivores including two all-vegan restaurants (Native Foods and Julia’s Kitchen) and one all-vegetarian restaurant with plenty of vegan options (Leaf Restaurant). There are also plenty of places that do stellar vegan options. So, without further adieu, here are my favorite vegan dishes in Boulder, CO. I highly recommend seeking them out if you’re traveling through this beautiful mountain town and are looking for a quality bite. 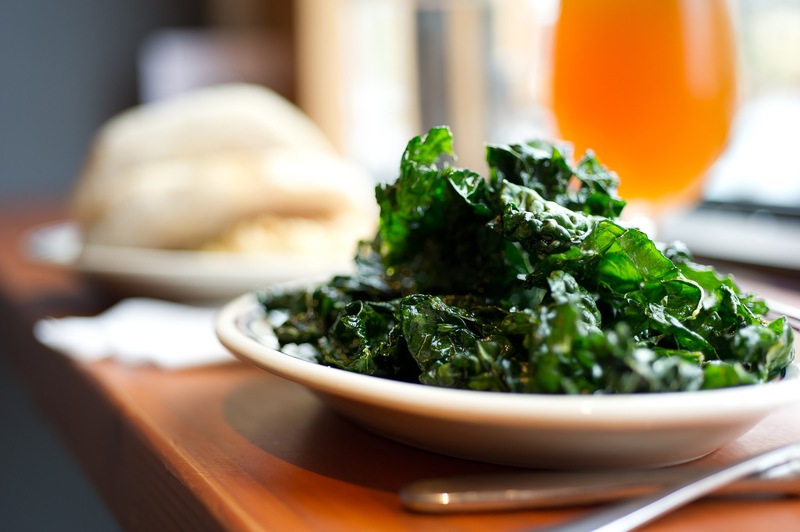 These fried homemade kale chips are amazing. They’re just the right amount of crunchy greasy goodness to pair with a tall glass of local beer. Or not. Get a window seat in this restaurant and view the Flatiron Mountains while you munch these. These delicious potstickers come with a variety of dipping sauces, and are sure to please. Zoe Ma Ma is located right off Pearl St, so you can enjoy these on a nearby bench or outdoor seating area in the warmer seasons. There’s plenty to enjoy on Leaf’s all-veg menu, but I have to call your attention to this rockstar dish: Beet Pierogis. The flavor combination of the sweet beet pure inside the savory outer shell plus cole slaw side is delectable. Shine is an entirely gluten-free restaurant, but not everything is vegan. But the vibe is the closest thing we have to Cafe Gratitude out here, so it’s worth it to sift through the menu to find the veg gems. If you go (which you should!) you’ve got to try the tempeh burger with a homemade gluten-free bun. Get it with a side salad (featured here) or sweet potato fries, and perhaps wash it down with a beer brewed in house or one of their non-alcoholic elixirs or potions. Shine is located at 2027 13th St, Boulder, CO 80302. The best cupcakes in Boulder, CO, period. These are fluffy and sweet and come in fun flavors like Birthday Cake. They don’t always have vegan cupcakes in stock, so call ahead, but when they do, it’s magic. This is the perfect booch! Just the right amount of sparkling-tangy-sweet. Grab it from Laughing Goat, Ozo, and many other places around town. Available at: Alfalfa’s Market, Ozo, Laughing Goat and more local retailers. This is the best veg Japanese special in town: get Oshinko, avocado, cucumber, garlic, mushroom, and many other fun pieces. You can order it without the miso soup and salad, which contain animal products. The best bubble tea in Boulder! This place does tea so beautifully, and their matcha latte is a standout. Pictured here with my favorite brother Asher. Native Foods is an all-vegan chain, so you really can’t go wrong with anything here, but I’m a big fan of the Yo Amigo Taco Salad. I usually sub out tempeh for the seitan taco meat. This salad features warm tempeh (or taco meat if you don’t sub it out) atop romaine, corn, tortillas, salsa fresca and black beans topped with a savory-sweet dressing. So good. An all-vegan Nepalese lunch buffet happens every Monday at Nepal Cuisine. If you’re in town on a Monday and can slip away to Table Mesa (just a few minutes from downtown Boulder), you’ll be very glad you did. Momos, samosas, okra dishes, and plenty of greens, plus a homemade almond milk rice pudding are all 100% vegan and the same percentage delicious. This Vegan Buffet on Fridays is amazing. It’s gourmet, extremely reasonably priced at around $14/person, and even features a complimentary glass of wine. If you want to do Fridays like a Boulderite (aka start the weekend early), mozy over to Jill’s and enjoy this. They always feature paninis, pizzas, innovative and unique salads, homemade dips and soups, gluten-free desserts and much more. Trust me, you’ll be glad you checked this out! Make a reservation in advance. Hope this list of my favorite vegan dishes helps as you plan your culinary excursions in Boulder, CO! There’s plenty of other good vegan food in Boulder, but these are my personal faves at the moment. What did I leave out on this list? Great post. You did leave out the vegan chicken parmesan sandwich with almond ricotta from Sun Deli! 🙂 It’s awesome! I loved eating in Boulder on one of our trips through Colorado. I’ve eaten at several Native Foods Cafe, and only been disappointed once, but not in Boulder. Loved Julia’s Kitchen. Thanks for the rest of the reviews, now I know we have options if we make it there again. This makes me want to go to Colorado right now. Beautiful food pictures. Thanks for compiling this awesome list I am sending it to some CO. friends today.